We are delighted to announce two Lectio authors as recipients of the 2015 Catholic Press Book Awards. 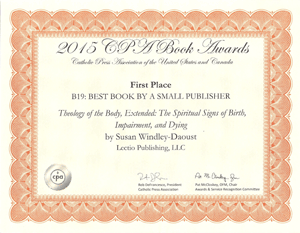 In Lectio’s first year to submit entries, Theology of the Body Extended: the Spiritual Signs of Birth, Impairment, and Dying (authored by Susan Windley-Daoust) won First Place for Best Book by a Small Publisher. 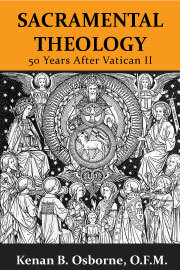 Sacramental Theology: 50 Years After Vatican II by Kenan B. Osborne OFM, won Third Place in the category (B22) 50th Anniversary of Vatican II. Congratulations to our winners and to the Catholic Press Association for another successful conference. The eBook textbook world just took another leap last week. The major players are Kindle, iBook, and Nook. Apple has enhanced their multimedia authoring platform (iBooks Author) to allow their books to be viewed on iPhones for the first time, yet more importantly, the iBooks can now be read (interacted with) on non-Apple devices such as Samsung Galaxy and Microsoft Surface tablets. James Rice has written a fine article “Did Apple Just Change Textbooks Forever?” interpreting this radical shift in the Apple ecosystem. Apple’s latest enhancements portend a huge shift in how we will disseminate classroom information in the not-too-distant future, and it makes for a much richer teaching-learning environment. This month we publish ed a book titled Sacramental Theology – 50 Years After Vatican II, which has been published as both a softcover and eBook. The book honors the 50th Anniversary of the Second Vatican Council (1962-65) and traces the major issues promulgated at Vatican II as they relate to both the meaning and celebration of the sacraments today. The author is Franciscan theologian Kenan B. Osborne, O.F.M., a scholar of international repute and is Professor Emeritus of Systematic Theology at the Franciscan School of Theology/Graduate Theological Union in Berkeley, CA where he taught for over 30 years. He is a frequent guest lecturer at numerous colleges and universities throughout the U.S. and the world, mostly recently in China and Korea. 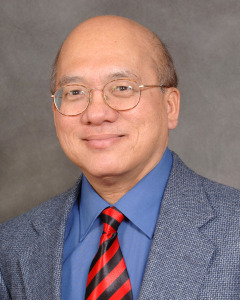 He is considered an expert in Christology, the sacraments, the permanent diaconate, post-Vatican II theology, and contemporary and Chinese philosophy. Information, and a downloadable excerpt, can be accessed on the Lectio Publishing website.